X- Sterling Silver 925 Round Rolo 2mm Necklace Chain 18"
Please note, the materials list includes everything you need to make all 3 colour pendants. It includes 1 x bail and 1 x chain for ONE complete necklace. 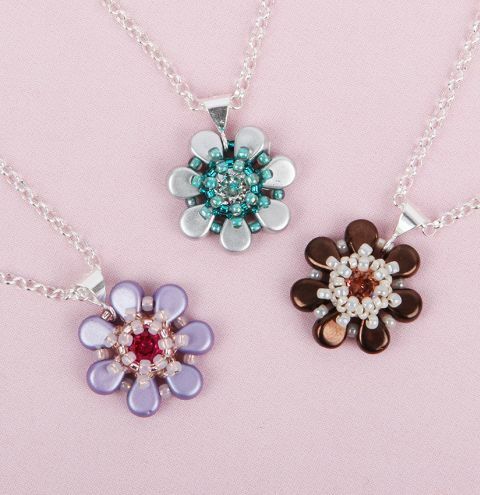 Learn how to make cute flowers using NEW Per Les Par Puca Amos beads! You could wear them as pendants or even turn them into a bracelet or brooch. This is a free pattern, offered by Puca. DOWNLOAD YOUR FREE PROJECT PATTERN. Please note, your project materials list includes everything you need to make all 3 colour pendants. It included 1 x bail and 1 x chain for one complete necklace. Please add further chain and bails to make more than one necklace.